As if that weren’t enough, the outfit’s showcasing a new Remote Driving Controller for its F3 Plus, which enables owners to perform a variety of driving functions — moving it forward / back, turning left / right and traveling at a “restricted speed” — without having the owner inside of the vehicle. Naturally, we’re anxiously awaiting a test unit of our own. Or, for a wave of lawsuits — whichever comes first. 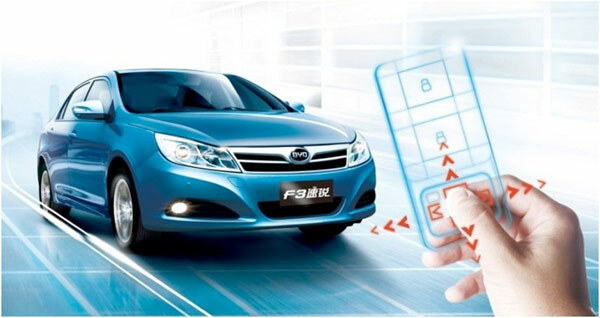 BEIJING–(BUSINESS WIRE)–Today, BYD unveiled two new exciting models – the “F3 Plus” and the Dual Mode “Qin” (pronounced “Chin”) at 2012 Beijing International Auto Show. This year’s Auto show theme was “Innovate and Excel” and BYD did both displaying 3 new break-through technologies in their new vehicles. The BYD Qin is an intelligent, next-generation, highly-efficient dual-mode electric vehicle that uses BYD’s new, innovative Dual Mode II system with improvements over the first generation’s F3DM system. These improvements include: 7% better efficiency, power and energy-saving and in pure EV mode, the Qin can travel 50 km (31 miles) on a single 10 KWh charge. In hybrid mode, the Qin can use both its 110 KW electric motor and its 1.5 Turbo (TID) engine to output 223 KW of power and a whopping 440 Nm of torque. With this amazing torque, the Qin can accelerate from zero to 100 km/h (62 mph) in only 6.9 seconds and has a top speed of 185 km/h (115mph). In hybrid mode, the Qin requires just 16 RMB (~$2.50 USD) of energy per 100 Km (equating to a little less than 2 liters of fuel per 100 km or 118 mpg). The Qin is also equipped with the BYD “i” intelligent cloud system platform incorporating features like telematics, cloud-computing and a full-range of services 24 hours a day (like roadside assistance, vehicle positioning, remote monitoring, music and video downloads etc..). The new BYD F3 Plus best represents the Auto Show’s concept of “Excel.” The F3 Plus uses BYD’s self-developed, 1.5 Turbo-charged, Direct-injection, Dual Clutch engine and incorporates, as a standard feature, the break-through “Remote Driving Controller” technology-a first for a mass production vehicle. The Remote Driving Control technology allows many driving functions to be performed remotely with a specially design remote “key.” With the key in their hands, the driver can start the car, move it forward or back, turn left and right, and travel at a restricted speed all by itself, without the driver being inside the vehicle. It is a perfect solution when the parking space is not wide enough for the driver to exit the car once parked. In windy and rainy weather, drivers can remotely move their car for easy entrance. Finally, BYD displayed another first in EV technology features – standard Bi-directional Charging and Discharging technology able to allow vehicle-to-vehicle (V2V) discharging for stranded vehicle assists, Vehicle-to-Grid (V2G) and Vehicle-to-Load (V2L) solutions. This technology transforms your EV into a mobile energy storage station. 2 Wheel Hand Carts | Electric Cars For Sale | Are YOU Looking for ELECTRIC CARS FOR SALE? Here's MOTOR SCOOTERS FOR SALE information for you!